Let's face it -- smartphones (namely, iOS and Android devices) are slowly chipping away at the portable gaming market. If you recall, Apple took a nice slice of the market-share pie -- and as you'll notice in the picture above, we're seeing the same trend this time around. According to data from Flurry and NPD Group, iOS and Android are earning a sizable chunk of the revenue in the portable gaming software sphere, with the Nintendo DS's dominant market share dropping from 70 percent in 2009 to just 57 percent in 2010 to accommodate the newcomers. We may be seeing the decrease in relative revenue because the PSP and DS are on the way out to make room for the NGP and 3DS -- however, this chart speaks only of the current-gen portables. But hey, it's easy for almost anyone to spend a single buck on a full-fledged game, right? Head past the break for some more videogame revenue stats, if you please. In the chart below, you'll notice that the combination of iOS and Android only puts the two at 8 percent of the total revenue of the whole videogame software market. 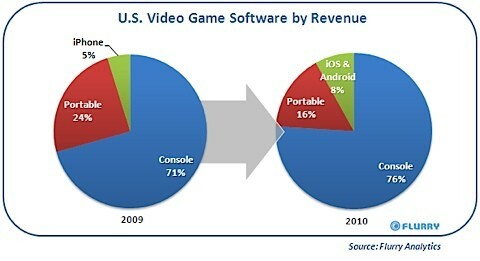 Sure, the two OSes have taken a bite out of the portable space, but in comparison to total video game software revenue, they aren't supplanting the consoles. We're actually seeing a decrease in portable gaming revenue overall from 29 percent to 24 percent of the United States' delicious gaming pie, while console games have jumped five percent in the meanwhile. Heads up though, these stats don't track usage, just the dollars being spent -- nothing says that guy who bought mounds of DS software didn't spend all day on his NeoGeo Pocket Color instead.